Happy holidays, everyone! I am writing from my Mom’s place in Oakville, Ontario Canada where my better half and Kate and I spent Christmas. 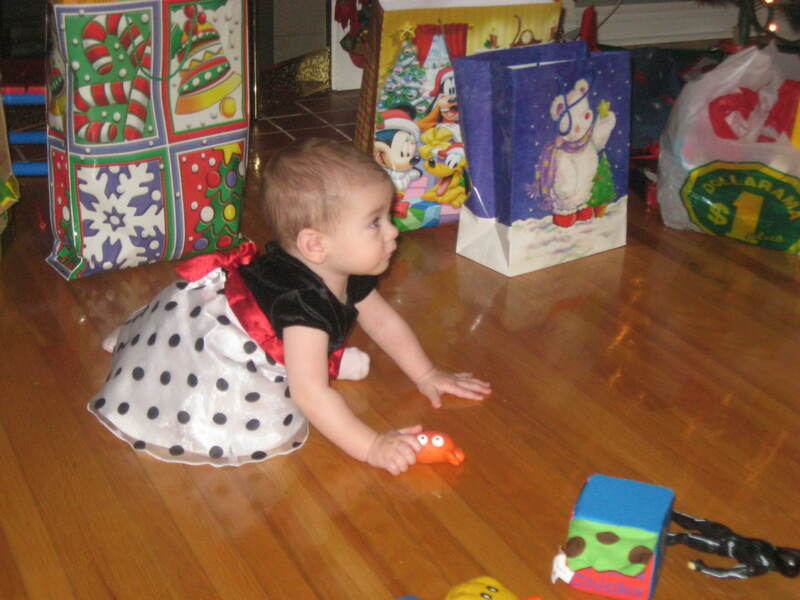 It was our little Kate’s first Christmas. 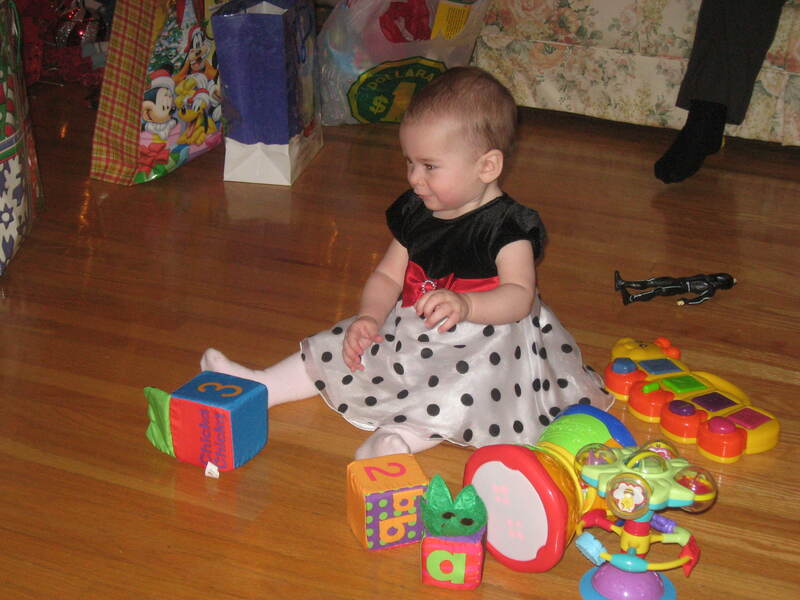 I’m a proud Mama, I can’t help myself, so I’ve posted a couple of photos of her in her special Christmas dress below. What a year it’s been at Spinning Music. It was a big year for me personally as I took a break from spinning for a few months to have my daughter Kate on April 1, 2010. While I was on mat leave, a stellar group of instructors kept the blog full of lively profiles and great songs – thank you so much to Denise, Judy, April, Tim, Beth Ann, Darcy, Selma, Lisa, Adrienne, Bob, Paul, Amy, Gabriela, Jenn, and Nancy for your contributions. Thanks, too, to all of the readers who took the time to post a profile on the Reader Playlists page, which is one of the most popular pages on the blog with over 13,000 views this year alone. Spinning Music saw an explosion in traffic this year. This little blog is now getting about 1,000 views a day and peaked at over 1,600 views on one day in October 2010. Just today, the counter rolled over to 600,000 views to date. The blog is now the fifth site returned by Google when you enter the search terms “spinning music,” right after the official Spinning website. I can only shake my head that my experiment in blogging has become a wonderful community of spinning instructors from all over the world. I am delighted and humbled to host this party. The sixth most-viewed playlist on the blog is Summer 2010 Hot Hits Spin Mix Plus More! posted by Spindarella (Amy) – it got nearly 3,000 views. Look for the third annual Top 25 Spinning Tunes of 2010 and Best of 2010 Spin Mix posts in early January. Best wishes to everyone for a healthy and prosperous 2011 with as much time on the bike as you can manage. Oh boy, here come the holidays. My better half and Kate and I are going to the in-law’s place this weekend for an early Christmas, then off to my Mom’s near Toronto on December 22 for a week with my family. From there we are flying to Cancun for a week on one of our favourite islands – Isla Mujeres, a sleepy place with great food and even better beaches. We rented a one bedroom condo across the road from the beach. It has a hot tub on the balcony. I know where I’m going to be when the clock strikes midnight on December 31! So, I got a comment from guest blogger Gabriela, who teaches in Richmond Hill, just outside Toronto. It’s not too far from my sister’s place – maybe a 20 minute drive. I am going to try to make her spin class on December 27. It would be great to meet her and take her class. I absolutely love her music. Maybe I’ll get to do a world tour one day and go to everyone’s classes. Now that would be cool. In other news, my gym got new spin bikes! Keiser brand. I love the fact that they have clips and a very smooth ride. I am still getting used to not having a horizonal handlebar adjustment or clicks on the tension bar. I’m finding it hard to find just the right tension with the bar. The new bikes have certainly been bringing the riders in. My classes have been packed. Anything that puts bums in seats is a good thing. This ride gives a nod to the holidays with Candlelight and Christmas/Sarajevo 12/24 but I offer substitutions so the playlist should have legs well through the post-holiday period. Otherwise it’s the usual mix of hits that blazed up the dance charts in the past year, with a bit of Can-Con thrown in. The Time (Dirty Bit) – Black Eyed Peas (5:08): I wasn’t sure I liked this song at first, but it’s grown on me. Adjust your tension so you can feel the road beneath your feet and let’s ride. Amazing [Kaskade Remix] – Seal (6:34): Reader Adrienne put me on to this awesome Grammy-nominated Seal song that went to #1 on the Billboard Hot Dance Club Play Chart. The remix starts a bit slowly, so I altered the song to start at 1:20 (you can do this in iTunes by going to File/Get Info/Options). This is a combo drill with some surges and climbs. What a Night (DJ Control Journey Mash) [feat. Claude Kelly] – Kontrol and Lil’ John (3:34): Reader Amy suggested this catchy mashup that has been on heavy rotation on my iPod since I downloaded it. She found it here but you can also find it at Dirty Mexican Lemonade, a blog full of catchy mash-ups [check out Better than a Stereo Dream.]. Longtime readers will know that I don’t use pirated music because I believe in paying artists. Dirty Mexican Lemonade claims all of their songs are legal. I’m no copyright lawyer, but according to Wikipedia, mashups that are sufficiently transformative can acquire copyright protection as fair uses so they might be right about that. It’d take an intellectual property lawyer to know for sure. Let’s do some lifts 8/4/2 seconds, one minute each. Watch for the f-bombs in the background vocals. According to You – Orianthi (3:20): This ditty from Aussie Orianthi has a country-rock feel. Like many country songs, it’s about a woman with a verbally abusive boyfriend. It struck a chord with me because I used to represent a lot of women leaving abusive relationships. We’re going to do some sprints from 0:33 – 1:03 (30 seconds), 1:32 – 2:27 (55 seconds), and 2:34 – 3:00 (25 seconds). Christmas/Sarajevo 12/24 (Instrumental) – Trans-Siberian Orchestra (3:25): Okay, you got me. If you’d suggested I’d be spinning to the Trans-Siberian Orchestra, I’d have said, “nawwwww….” But here we go with a wicked seated climb with LOTS of resistance. Keep the RPMs at least at 60 though, to protect your knees. After the holidays, substitute with the cheeky Whoa is Me by Toronto hipsters Down with Webster. We R Who We R – Ke$ha (3:25): More lifts 8/4/2, one minute each. There’s a natural break at 1:12 and 2:15 – good places to switch. People love or hate Ke$ha, who says she wrote this song as a response to the recent rash of suicides by gay youth. The song debuted at #1 on the American Billboard Hot 100 Chart. For a similarly viral response to these tragic suicides, check out Dan Savage’s It Gets Better project, which made me fall in love with him a little bit. Naturally – Selena Gomez and The Scene (3:23): More sprints at the choruses. Do ’em seated or standing, your choice. (Standing is tougher.) They’re at 0:47 – 1:17 (30 seconds), 1:43 – 2:12 (30 seconds), and 2:30 – 3:00 (30 seconds). This song went to #1 on Billboard’s US Hot Dance Club Songs Chart. If We Ever Meet Again [feat. Katy Perry] – Timbaland (4:53): Recovery from 0 – 0:40 then a peppy climb. Get aggressive at the choruses. Timbaland said the Black Eyed Peas’ I Gotta Feeling inspired him to write this upbeat tune. Magic [feat. Rivers Cuomo] – B.o.B. (3:16): I can’t help loving this cheeky song. More lifts with resistance at 4/10. Start with 16 counts, then go to 8, then 4 (one minute each). Find Yourself [feat. Sarah Howells] (Radio Edit) – John O’Callaghan (2:32): I used the short radio edit for this song by Irish DJ O’Callaghan to get some last sprints or surges in before the cool down. The first one goes from 0:00 – 1:13. There’s a short break from 1:13 – 1:56 (43 seconds), then a last 21 second push from 1:57 – 2:32. Stuttering – Fefe Dobson (3:10): Cool down with some easy spinning to this Toronto artist’s catchy new single. Her debut CD earned two Juno nominations; her record label dropped her without even releasing her second CD after the first single failed to chart. She persevered and was re-signed to her original label and launched her third CD in November – this is the second single from that disc. Go Fefe! Down [feat. Lil Wayne] – Jay Sean (3:32): More cool down and goodbye music. What are the holidays without stress? 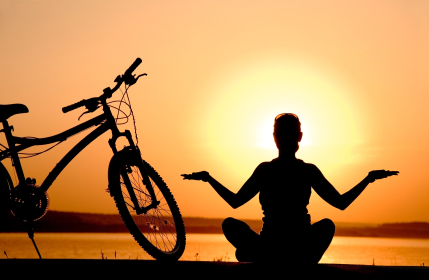 It turns out, if you’re looking to put a little happy into your day, that yoga is the thing. Researchers at the Boston University School of Medicine found that people who did an hour of yoga three times a week reported being happier and less anxious than people who did light walking for the same amount of time. This is great news for those of us who have to grapple with 4-5 months of winter every year. If you just can’t bear to go outside and exercise in the dark (because, hey, it’s dark before 5:00 p.m.), pull out your mat and see if you can get a little closer to mastering crow.